There will be a prize each month! This month's prize is a little different, and we hope you like the change! Each DT member is showcasing a digital image, and you could win that image! There will be a winner from each participating DT member's blog. WINNER: The winners will be randomly chosen from comments received on DT member blogs. The winners will be announced on the CDS blog Thursday, January 24th. How fun!!! I am off to see the hop!! Wow. I just stumbled upon your blog. Lucky for me! 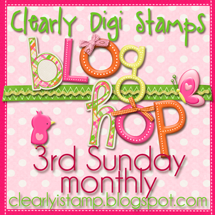 I love the versatility of digi stamps. And they are so easy to store. Can't wait a moment longer to begin your hop. What I've seen so far makes me want them all. I had trouble leaving comments on Barb, Lisa, and Jersula...I'll keep trying...love their work too. I am excited to hop about with you! What a fun hop! Just love all the new things used by the design team. Such enablers you are! Thanks for the fun and inspiration!